One of the big thoughts that I’ve been bouncing around during the production of Norumbega is that I want the central dice mechanic to mirror the thoughts, feelings, and belief structures of the characters. I’ve written briefly in the past about my thoughts on dice mechanics matching the character actions, and I’m a big believer in the idea that the mechanics should serve the setting. In a setting that’s emphasizing harsh environments, trudging through snow, negotiating with hostile nations, contrasted by peaceful interludes, a standard D20 feels inappropriate. In Norumbega, the way you roll the dice varies based on your beliefs. The Viking Age was a really tumultuous time religiously for Scandinavia, and I feel hard pressed to try and make a game about any portion of that time that doesn’t at least touch on it. Especially if you focus in on the 10th and 11th centuries, you see a sharp turn from wide-spread paganism and polytheism to a hybrid monotheism, to devout Catholicism. This kind of change in a society would impact a person over the course of their life, especially if that life is spent ensuring the safety of that society. I want this game to represent that impact mechanically. Flame: Ferocity, physical action, brutality. Hearth: Inter-personal aptitude, self-confidence, charisma. Mist: The unknowable, the weird, the mysterious. Characters will be able to assign bonuses to these attributes between -1 and +2 at the start of play, based on the Roles that they choose, which I'll discuss in a later post. While the attributes themselves will not change, the way that players roll the dice and add them will. Every character will start with the belief in The Old Ways. This is a purposefully vague stand-in for early pagan rituals, and the players are invited to interpret what it means specifically on an individual basis (each role with have a description of what each faith means to them). When a follower of The Old Ways starts a new day, they Cast Runes. 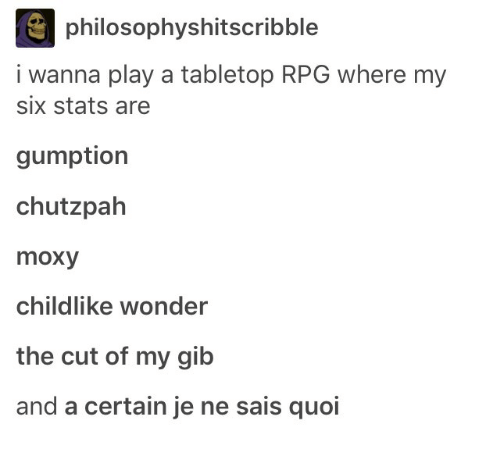 For each attribute, roll 1d6. Keep a note of that roll, or keep the die next to the attribute on your sheet (if you have enough dice). These are your runes. For the remainder of the day, any time that the Narrator asks for a roll, only roll 1d6. Add that roll to the rune of the appropriate attribute, as well as any inherent bonuses your character may have for that attribute, to get your final result. The Old Ways are all about looking ahead-- while the results may be tumultuous, and often not what the player wants, it gives them a unique glimpse into the future to play off of. For example, if a strength-focused character rolls a 1 on Flame and a 6 on Mist at the start of the day, they may cater their actions to fit their fortunes, rather than the usual strengths of their role. The unknowable quality of The Old Ways also primes them for being affected by moves that the characters make, as their actions affect the fortunes that guide them. When a character fails a roll or completes one of their personal missions, they mark one point of experience. After six points, the player may advance their character. There will be a lot of options for advancement, such as improving an attribute or gaining a new move, however one of the options will be to Change Your Belief. This represents a major change in the way the character approaches the world, and the way they operate mechanically within the game. When changing your belief, the character progresses to the next form of faith. Once a character has changed to a belief system, they cannot select that faith again later on. If a character advances through each faith, their next advancement option must be retirement, which is a separate feature that I'll write about eventually. As the theme of this game requires the passage of time, I want there to be a mechanic for easily moving to a new character, and potentially passing on some of the aspects of the previous one, if desired. The following will be a rough outline of the remaining faiths available. The names aren't finalized, and there may be more down the road, but this represents the mechanical shift that can be undergone by each character throughout the game. On taking this belief, roll for each attribute as per The Old Ways, but these numbers do not change daily, and cannot be changed by moves. Once per long period of rest within the settlement, a character may select one attribute to re-roll, and keep either the new or old result. Rather than rolling runes for attributes, assign 3 to each, representing faith. These numbers can be modified by any move that would modify runes. You have abandoned the gods, and so too have they abandoned you. Erase all rune numbers from your sheet, leaving only your character's innate attribute bonuses. Continue to only roll 1d6 when asked for a roll. As with Monotheism, assign 3 to each attribute. When you make a roll, after calculating and acting on the result of the roll, add one to the rolled attribute, and subtract one from another attribute. I feel as though I may add more, or potentially take one away. In addition to beliefs, characters will have other important choices available at advancement. This will include things like their place in society, or acceptance of new technology and discoveries in the world. My hope is that there will be many opportunities for rules to interact in unique ways because of this. What do you think? Is this interesting, or too mechanically heavy? When you look at early maps of the American north-east, right up until we started calling them colonies, there is a tiny marking along the coast called "Norumbega". To this day, nobody knows for certain what it is, but the rumor is that when the vikings first came to Newfoundland, they found the harsh environment of Baffin Island ("Helluland") untenable, and traveled south through deep woods ("Markland"), until they reached the promised "Vinland". There, they established Norumbega, a great city with halls of gold and fertile earth and an overwhelming sense of peace. It's a city that vanished after colonisation, either through war, or natural disaster, or (more likely) cultural assimilation. The idea of Norumbega was an understandably enticing one towards the middle and end of the Viking Age. In Vinland, they could work the soil more easily, catch fish from the shore without danger. The hills and valleys formed natural fortresses, and there could be long stretches of time without the need for violence. Like all pilgrimages, those who sought out Vinland were truly hoping to make a change. Around this time in the 11th and 12th centuries, Christianity was spreading through Norse culture, and the old guard found themselves dying out, traditions kept on only in little bits and pieces. The search for Vinland, for Norumbega, represented a chance to start fresh for some, and to bring the old way to a place where it would not be touched. Norumbega is also a tabletop role-playing game that I'm writing about that search, and I'll be keeping track of what I'm writing right here. In the game, players will take on the role of the leaders of a settlement, trekking from the icy Helluland towards the promise of Vinland in the south. They act as scouts, trailblazers, and protectors as they find a path towards their new home. This journey may take years, but the knowledge that finding this land will keep their families safe is what makes it worth taking. As players progress through the lands in Norumbega, from the icy Helluland, to the wooded Markland, to the open fields of green in Vinland, the world around them will change dramatically. They'll have to make choices about how they react to it. As they head south, the needs of the settlers will change, religions will take rise, they'll meet colonisers and the native skraeling, and each of the characters will be forced to grapple with question: is hanging onto the old ways really worth it? Been considering lately how little I enjoy d20 mechanics when it comes to large-scale encounters. While rolling a d20 and adding Dexterity is a decent fit for getting your dwarven fighter across a pit trap set deep into the mine, it rings somewhat hollow when applied to commanding legions across the field of battle. In a Star Wars game, for example: while it is exciting to roll dice and follow standard mechanics from the perspective of a single fighter pilot, it is somewhat less exciting to play the role of a general using the same mechanics. A game for 3+ players. Requires a long hallway or open space, and a stack of standard letter-sized paper. One player takes the role of the Narrator. The other players are ace pilots in The Rebel Fleet. The Rebel Fleet can be any aerial force– be it World War II, outer space, or an alternate universe where lizardfolk ride tamed pteradons. To create your vehicles (effectively your characters), each player should use one piece of paper to make a paper airplane. There are no rules for the shape that this plane must take, only that it must consist of a single piece of paper (8.5" x 11" if you’re American, A4 if otherwise). As an optional benefit, you can use a staple or paperclip to weigh down the nose of your craft. The Narrator sets the scene. First, they should make one paper airplane for each major aircraft in the enemy fleet. For small squads, make one plane to represent a group of 5 or 10 (so you don’t waste all that paper). While making their planes, the Narrator describes the powerful regime that has ruined everything, which the Rebel Fleet is fighting against. Describe the battle that is taking place, and the broad strokes of the rebel fleet’s goals. Then, they ask what the players would like to do to achieve that goal. Race: The players and Narrator all stand on the same side of the space, and at the same time throw their planes in the same direction. The plane that makes it the farthest is the victor. This is used to represent outmaneuvering other planes, making it to destinations quickly, or rapidly closing on a target. Battle: The players stand on the opposite side of the space from the Narrator, and then simultaneously the two sides throw their planes at each other. Make note of the planes that collide. If a plane crashes its nose into an enemy ship, it deals damage to it. Most enemy ships can only withstand one damage, while named ships (the players, or important enemies) can withstand five. Repeat until all named enemy ships are defeated, or until the players are defeated, or until the players opt to try a different approach. At the end of each challenge, take a moment to discuss as a group how that maneuver took place, and describe how it moves the battle along. Continue until the players have achieved the goal stated at the beginning of the game.